Microsoft Dynamics Marketing is an integrated marketing management solution for marketing operation, planning, execution, and analytics across all channels—digital, social, and traditional. It enables marketing teams to plan, execute, and measure marketing campaigns across channels, from start to finish, to bring marketing vision to life. 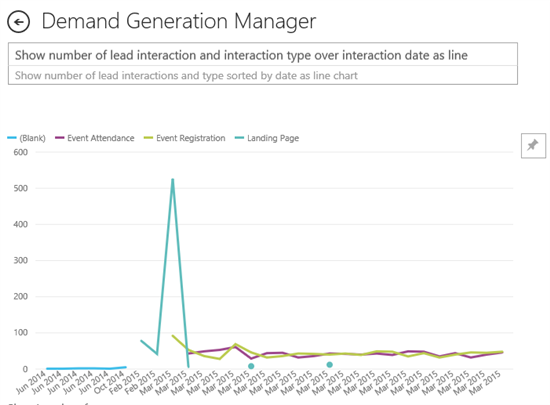 Today, we’re very excited to share with you a fantastic new analytic capability that we are adding to the Power BI product that targets specifically the Role of a Demand Generation Manager with Microsoft Dynamics Marketing. As a marketer you are constantly extending and updating your target audience for your marketing activities. You are collecting information from and about your prospects on an ongoing basis. Your campaigns send out email marketing messages and other communications and you record responses like visits, signups, event registrations and attendance records. The amount of data that modern marketing activities generate is large and at the same time it is essential to measure results and convert observations in actionable optimizations, detect trends and adjust your marketing plans. The right data is exposed and modeled into a consumable format. A rich set of out of the box analytics reports that allow you to ramp up quickly for your own marketing analytics. An environment that provides analytic reports, dashboards and KPIs in an easily consumable way for the employees in your organization. 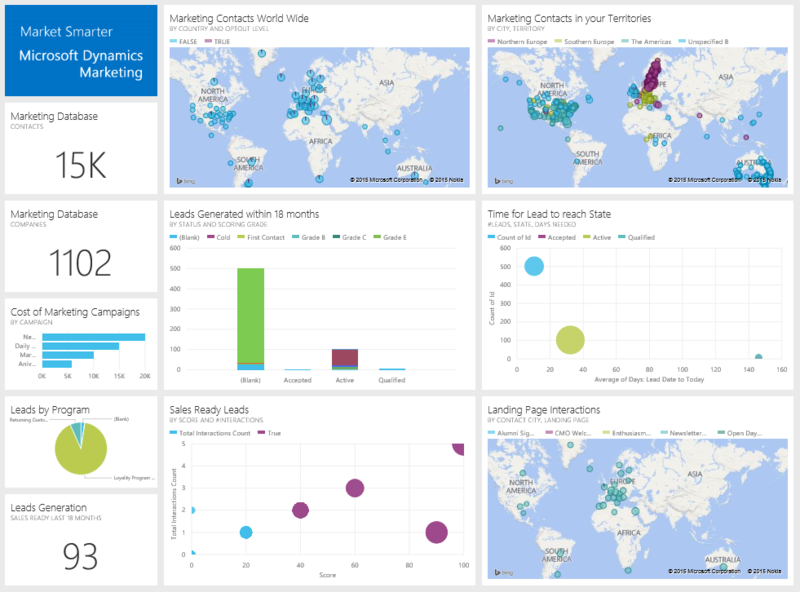 Connecting to your Microsoft Dynamics Marketing from Power BI is easy; immediately after you connect you will be presented with a carefully crafted dashboard that shows you at a glance some key insights in your Microsoft Dynamics Marketing data. 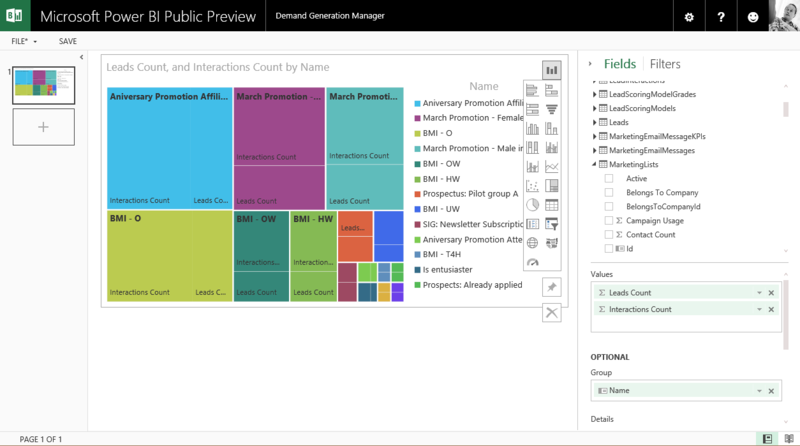 Check this article on how to connect to your Microsoft Dynamics Marketing account with power BI. Once the dashboard is fully loaded with your data, you can click on any of the visuals to view a more detailed report where you can further apply filters, drill into more information and gain a lot more insights about your data. You can also use Power BI’s Q&A where you can ask natural language questions to further explore your data. The answer will be given as the chart below. You can then pin this visual to your dashboard if you want to keep monitoring it. You can also pin data from other datasets to your dashboard. For example, if your Sales team uses Microsoft Dynamics CRM to manage opportunities, accounts and more then you can now build the combined Dashboard showing both Marketing analytics and measure end to end performance that include the resulting sales activities. Different marketing teams could be interested in exploring a different sets of data than others. 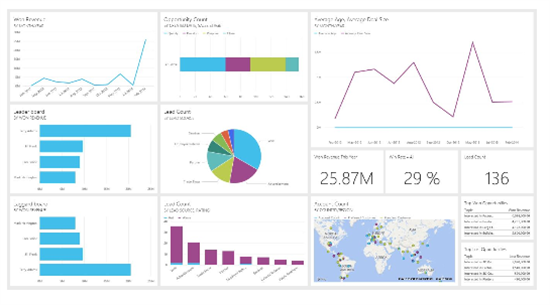 If the out of box dashboard and report don’t fully provide all the insights that you need, you can easily and quickly create your own reports. Just click on the Dynamics Marketing dataset, an empty report will open for you to start exploring your data. You can drag the fields you want to explore from the fields list to the canvas, choose the visual type you would like to create, apply any further filters in the filters pane and finally save the report. 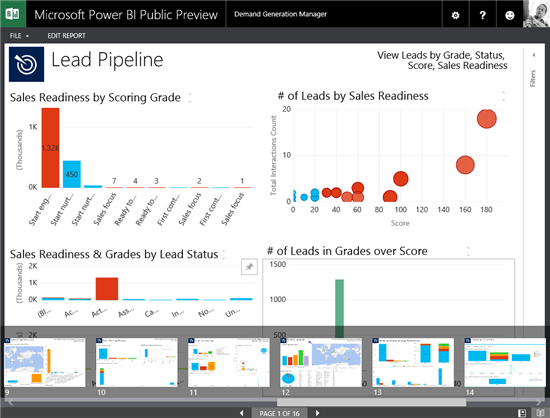 You can also pin visuals from your custom reports to your dashboards. For all Microsoft Dynamics Marketing users, we hope you will love this new addition to Power BI. We would love to hear your feedback and questions. You can contact support either by clicking the “?” when you’re signed in to your Power BI account or from the “Contact Support” link on our support site.